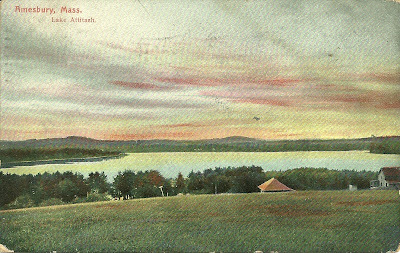 Postcard postmarked May 10, 1911 at Amesbury, Massachusetts, addressed to Miss Clara Platt at 279 Richmond Street, Waterbury, Connecticut. The card was sent by someone whose first initial was, I believe, "F". Interestingly, in the message, "F." indicates that her sister's house is partially visible in the card . Perhaps a reader with ties to Amesbury might recognize the house and know who lived there in 1911. As for Clara Platt, I found multiple possibilties. I'm assuming that Clara had never been married, since she was addressed as "Miss". 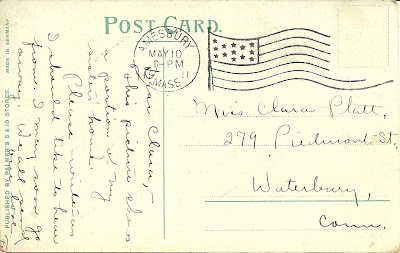 I found four or more Connecticut women with the married name Clara Platt, married to a Frank, a Charles, a William and an Alfred, but I'm going to pass on them unless I'm reading the "Miss" wrong. In Waterbury, Connecticut, I found two unmarried Clara Platts. First, a Clara Maria Platt in the 1880 Census, who was born about 1862 in Connecticut, the daughter of Henry Bellows Platt, born in Vermont, and wife Martha Maria Graham, born in Connecticut. I couldn't find further information on her to see if her name were still Platt by 1911 or not. Second, the niece of Clara Maria Platt, Clara Belle Platt, who was born 3 October 1891 in Connecticut, the daughter of Frederick Leonard Platt and wife Fannie Belle (Coffin) Platt, both born in Connecticut. 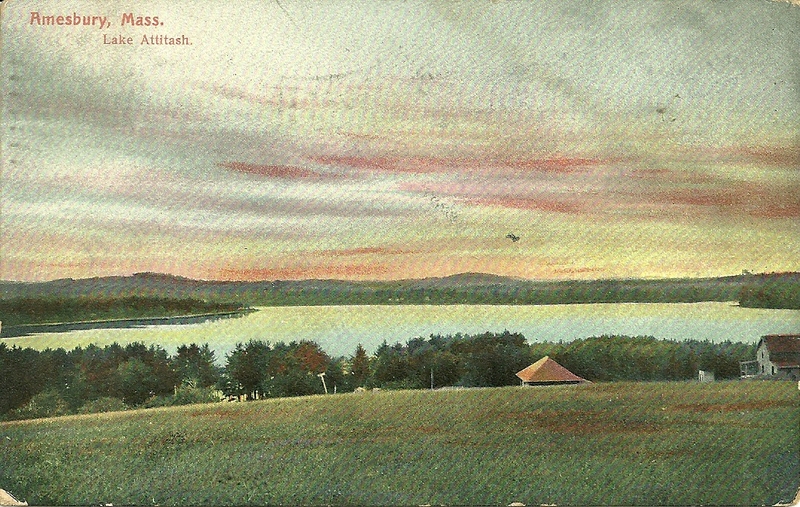 Clara hadn't married by the time of the 1910 Census, when she was still living in Waterbury with her parents. After that point, I lose track of her; perhaps she married. 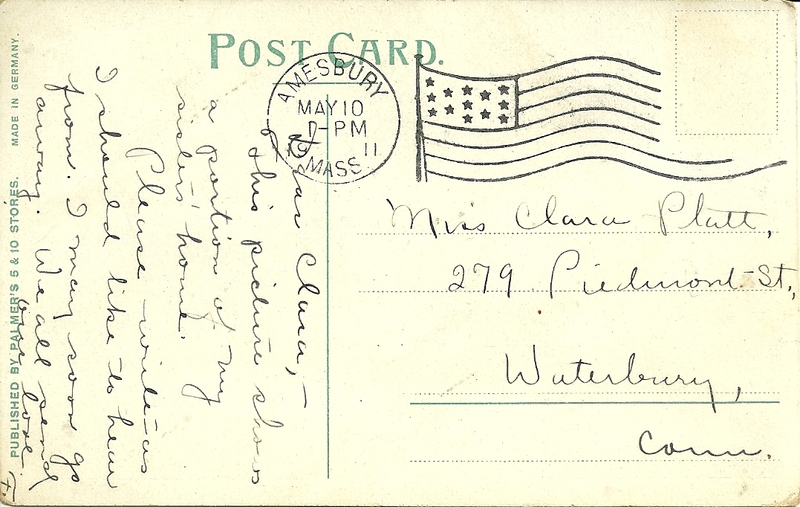 If you have any insights into the relationship between the Amesbury sender of the card and recipient Clara Platt, please leave a comment or contact me directly. Thanks!